NRF，full name is National Retail Federation, is the biggest retail trade association in the world. Different from the other retail exhibition, NRF is more concerned about the online and offline technology and solutions of the new retail in the mobile Internet era. The site exhibition is mainly based on innovative products and technical solutions, including physical store marketing, digital stores and other new technology, it objectively represents the advanced concepts and trends in the retail industry. 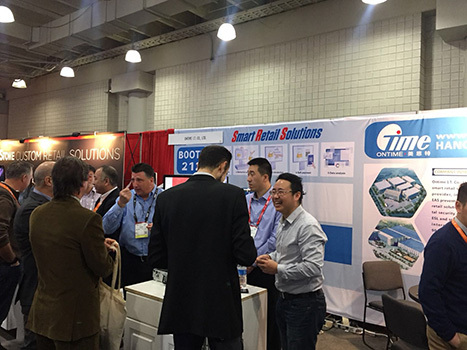 This year NRF, ONTIME welcomes global customers with a new attitude. 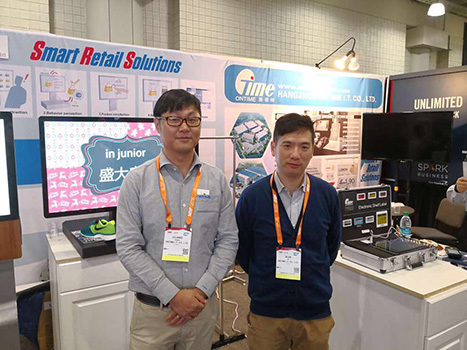 ONTIME iknow Smart Retail Solutions、RFID Retail Application Solutions、ESL Electronic Price Label Solutions、Digital Security Display Solutions and other products, shows our actively explore and innovation achievements in the retail field totally. In the smart retail field, iknow products greatly enhance the efficiency and application value of online and offline connection, help retailers realize the optimization of the shopping experience and workflow. ① Let consumers have the initiative to enjoy better shopping experience. ② Simplify the store workflow, and let the employees take off the complicated and monotonous daily work. ③ Simplify the marketing links for brand operators to reduce the costs. Iknow products focus on interactive experience and realize online and offline interconnection. Through the terminal hardware to collect massive real-time live data, so that big data technology gives more value to the application scenario, to provide brand operators solutions for intelligent retail scenarios, improve sales conversion rate, and significantly reduce marketing costs. We want to be more professional by concentrating in this field and to provide better services for more brands.